Dr Dawood Amoo, a renowned Islamic preacher in Ibadan, Oyo State,has defined the birth of the baby boy holding a pocket-size Qur’an among the signs of Allah. In an interview with journalists in Ibadan, Amoo said although the development was not strange, the boy named Ismail was unique as the said mini Qur’an contained all the 114 chapters in the holy book. The preacher testified that he was one of the earliest callers at the Owode/Academy, Ibadan residence of the parents of the baby to witness one of God’s wonders. He said the mother, Jelilah, gave birth in a church at Oniyanrin area of the city, where the baby was seen clutching a strange object in his left hand. “The woman, who took the delivery, thought it was one of the devilish drugs used by the mother to terminate the pregnancy, hence she threw it in the dustbin,” he explained. Amoo said that the said object, which later turned out to be a pocket-size Qur’an, was wrapped in a thread. He said that with the forceful removal of the object from its hand, the baby became restless and continued to clutch an empty fist. “They were all afraid to touch it until I got there and I had to remove the remaining thread on the object and to my surprise, it was a beautifully- designed pocket-size complete noble Qur’an,” Amoo Said. He said although the Qur’an was small, the lettering inside was readable and complete from chapter one to chapter 114 of the holy book. Expectedly, the news filtered into town and Ibadan people had since turned the residence into a mecca of sort. Jelilah, the elated mother of the baby, said since September, when the baby was born, nobody could take the Qur’an away from him, as he would be restless until he clutched it. 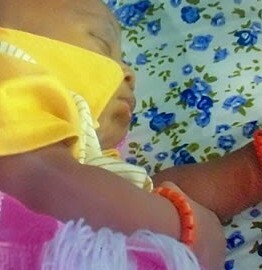 The father of the baby, identified simply as Semiu, said he thanked Allah for the blessings, saying it was an indication that Allah wanted them back in the fold of Islam. Semiu, a driver, said paucity of funds has caused his wife to put to bed at a nearby church, as they were both not practising any faith. 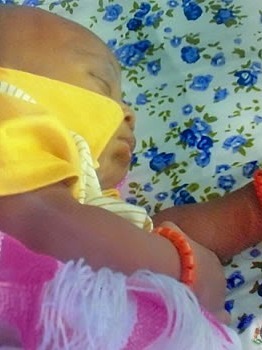 A similar baby was born in a Lagos church in 2012 clutching a copy of the Qur’an.